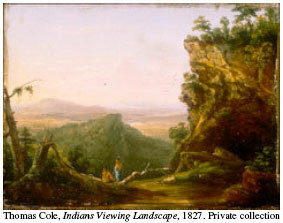 Hudson River School artist, Thomas Cole, painted from this very spot for his painting, Lake With Dead Trees. All those dead trees around the lakeshore are now gone, and if anything, the lake looks even more pristine than it does in his painting! North and South Lakes used to be separated by an earthen dam, and South Lake was private property. Eventually the land went to New York State. The dam was removed, and the area has since been referred to as North South Lake. This spot was, gratefully, very easy to get to. 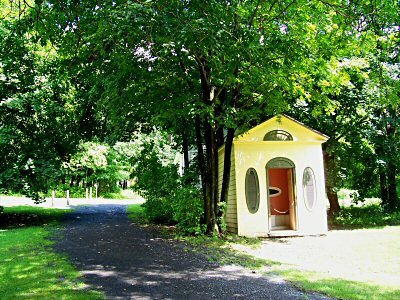 It’s right near the Recreation Center for the Catskill Park, run by New York State. Visitors can rent kayaks, rowboats and paddle boats to use on the lakes. There are swimming beaches and campsites. Although there was plenty of activity, there was also a beautiful serenity there. After our strenuous hike up to Kaaterskill Falls, my husband and I found a shady, quiet spot along the lakeshore to spend a quiet afternoon. Please email Jamie at JamieWG@aol.com if interested. 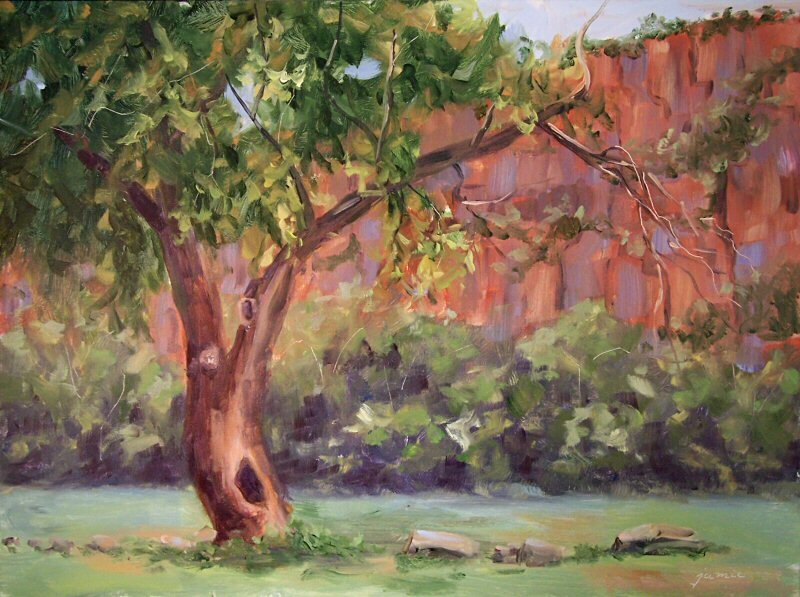 This is the second painting that I did at Kaaterskill Falls in my quest to follow the trail of the Hudson River School painters. Just as I was completing the first, the sunlight began to hit the falls. Tempted as I was to move on to another location at that point, I decided to stay and paint the falls from the top while I had the light. There were lots of hikers climbing up at this time. I was surprised that most of the hikers didn’t go early to beat the heat like I did! On the first day of our trip, we visited the home of Hudson River School painter Thomas Cole. 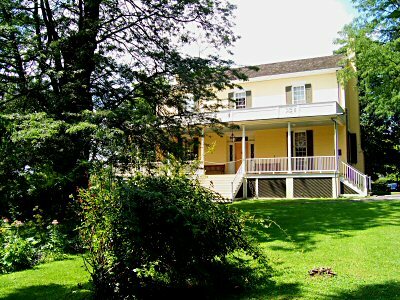 The house was part of a 100+ acre fruit farm during his lifetime, owned by his wife’s family. 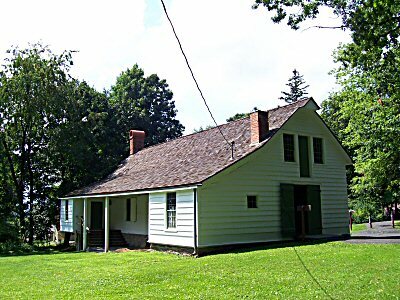 She had to sell off most of their possessions after he passed away, so there are a lot of reproduction and period pieces in the house, but few that were actually there when Thomas Cole lived in the home. 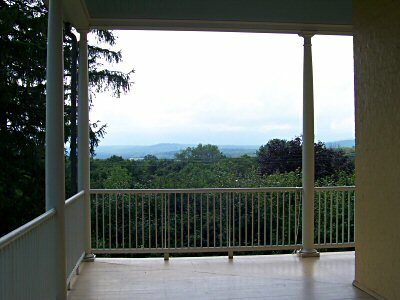 Here is a picture I took of the famous view from the porch of his home. Unfortunately, it was heavily overcast that day, and the wonderful Catskill skyline that Cole had was obscured by cloud cover. Adjacent to the house was a barn. Cole converted half the barn into his studio. The interior has great north light from a ground level window and one above. The walls inside it are brick and wood, so even with the cool north light, it has a warm, cozy feel. Many of his things were still there in the studio. Between the house and barn is an outhouse. You wouldn’t think it would warrant a picture, but I took one because it has the distinction of having three seats. Why, I can’t imagine. Starting at Thomas Cole’s house was a wonderful start to our trip. It set the stage for all the locations to come. I felt inspired, setting out to visit the spots where he had painted. Having seen the exhibit of his reference paintings for the studio works, I decided that I would keep whatever paintings I did on this trip, and use them as my own references, alongside photos I took, to do studio and commission paintings. This scene is available as a studio/commission original painting in any size/price range. Please email Jamie at JamieWG@aol.com if interested. What is the tallest waterfall in New York State? Niagara? Nope, guess again. It’s Kaaterskill Falls! 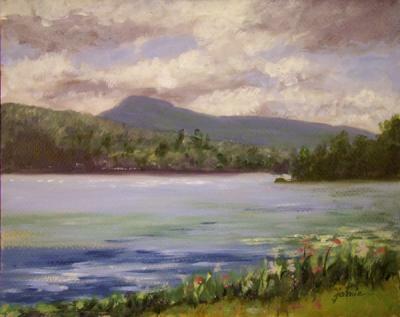 My first opportunity to paint on our trip, following in the footsteps of the old Hudson River School painters, was after climbing a half mile up to the base of Kaaterskill Falls. You wouldn’t think one would have to climb so far uphill to get to the bottom of a waterfall, but it is indeed far up the mountain. I don’t think I would have made it without my new ultralight painting box in my backpack. I didn’t have to carry a thing, and my pack was nearly weightless. 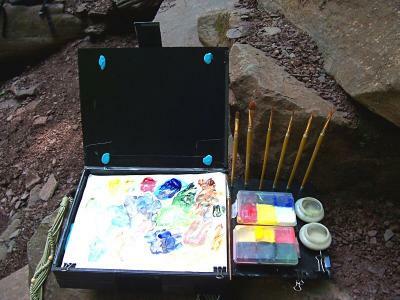 Here’s a photo of the new painting box and my palette for this painting. I’ll be posting more photos of how the box was constructed in the week to come. You can see that I’ve added an extension to it, which can hold my brushes and palette cup. In the early morning light, most of the fall was in shadow, so I chose a scene that focused on the waterfall/cascade right at the base, where the light was strongest. 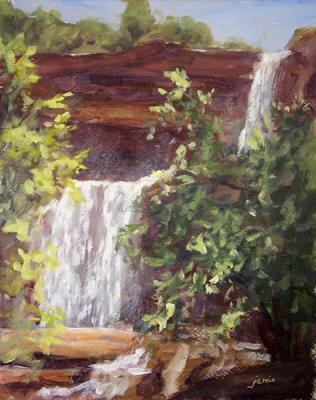 By the time I was finishing up this painting, a little light was just beginning to hit other parts of the falls. I stayed to do a second painting that included the top tier of the falls as well. I’ll be posting that one tomorrow, so stay tuned! Thomas Cole and many of the Hudson River School painters painted from this very spot. 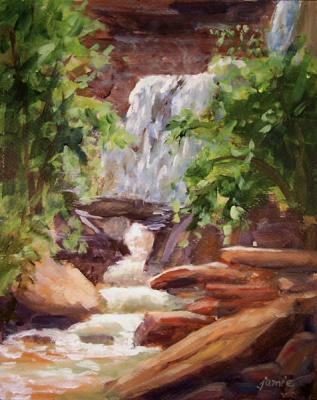 There are beautiful cascades all the way up the trail to the base, inviting a series of paintings. In fact, the beautiful Bastian Falls is right at the bottom before the trail even starts to ascend, but it’s definitely worth it to make the climb to the top to experience Kaaterskill. I’m sure I’ll be coming back here many times in the years to come to take advantage of other locations along the way. We intentionally went the day after a heavy rain, figuring that there would be a significant increase in the amount of water coming over the falls and the drama it created. We were right! Most of the paintings and photos I’ve seen of this waterfall display a far narrower stream of water. We chose the right time to go, even if the way up was a little wet and slippery! $495.00 plus $25 shipping and insurance within the Continental United States. For local sales, shipping charge will be allocated to NYS Sales Tax. Please email me at JamieWG@aol.com for International purchases or with any questions. 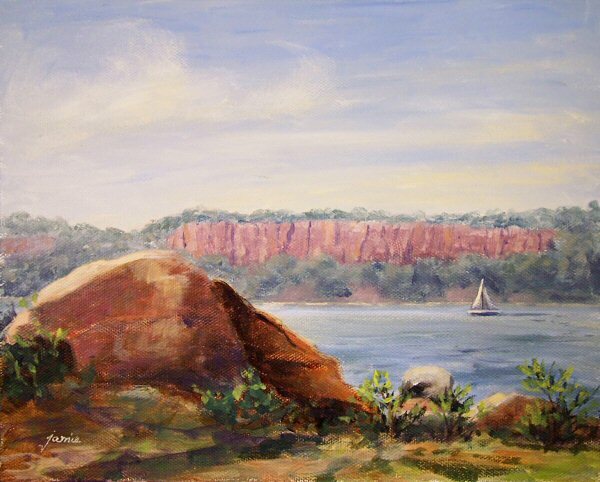 A member of our plein air group got permission for us to paint very early in the morning at this fabulous location beneath the Palisades in Nyack, New York. It’s not long before the sun travels high enough to dim and cool the light on the cliff face. Although the sun was in and out of the clouds (mostly in), we did get some good color on the rocks. It was a fabulous location. I’d love to return in fall! 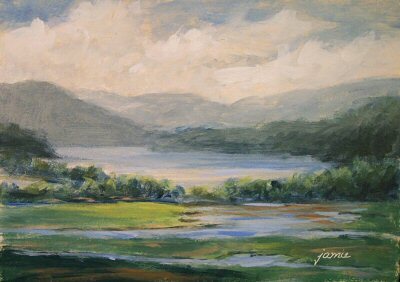 I just returned from my trip up to the Catskills, where I painted in the footsteps of the old Hudson River School painters. I visited the locations depicted in the paintings, and had an amazing trip doing my own versions from those famous spots. I’ll start posting photos and paintings from my trip beginning tomorrow. I’m still photographing the paintings and sorting through images. Please stay tuned! I’ve been busy constructing a new painting box, preparing for a trip, and painting. I haven’t had a chance to photograph work or post images of the new box, and I’ve got a time crunch on my hands to keep painting while getting everything ready for my trip. I’ll be posting daily again starting next Monday, July 28, and will show you my new painting box then too. Thank you all for your kind comments, support, and appreciation of my work. ‘See you next week! $265.00 plus $15 shipping and insurance within the Continental United States. For local sales, shipping charge will be allocated to NYS Sales Tax. Please email me at JamieWG@aol.com for International purchases or with any questions. 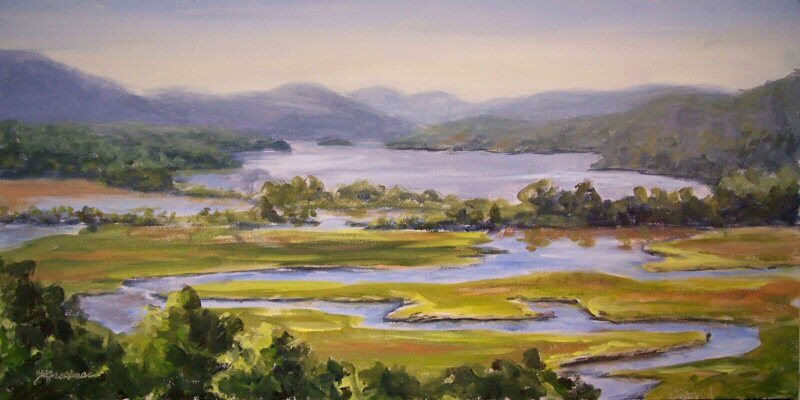 I was down painting in Hastings-on-Hudson this morning. The Hudson River view was gorgeous as always. The sun hit the cliffs in the early morning light, giving them a reddish color. As the morning wore on, they became darker and more violet. I am always amazed by how much the color of the cliffs changes so quickly there. I stuck with my early morning version. After painting, I went to a wonderful exhibit at the Hudson River Museum of the work of Anna Richards Brewster…..highly recommended! 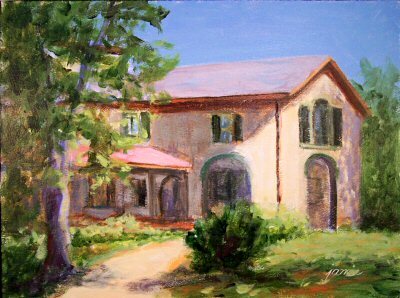 I spent a wonderful morning painting with friends at the historic home of Samuel Morse, inventor of the telegraph! His estate, Locust Grove, in Poughkeepsie, NY has exquisite, specimen trees, colorful gardens, and challenging architecture! Although the property overlooks the Hudson River, the area is overgrown, and only a glimpse of the water is visible. I was captivated by the light hitting the house in the morning sun. Today is one of those unbearably hot and humid summer days, so I set out early for Boscobel Restoration in Garrison to beat the heat, and did just one small painting. The Hudson was shrouded in more than its usual share of haze with the high humidity. I found Golden’s Titan Buff color to be the perfect palette addition to capture that atmosphere. I painted the entire panel that color, then painted into it with my other colors. I love the effect it gave! 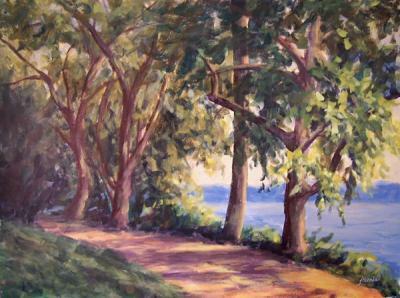 This is another painting done on location at Stonecrop Gardens in Cold Spring, New York. This little pond near the entrance not only had stunning birch trees, but beautiful pond lilies as well. Those will have to wait for another painting, hopefully soon! Here’s a slightly larger version too. I had to use a magnifying glass while painting to get some of the details in on the figures and the house! The beautiful gold frame is actually a dollhouse frame. I cut the board to fit the frame, and then did the painting to size. It will be sealed and varnished, and will look just like a tiny oil painting in a frame. 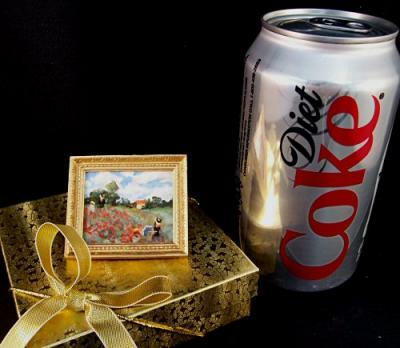 These miniatures can be purchased with a pin back so you can wear your art, or a gold thread for hanging from a brass tack, or a miniature easel to stand on a table. I ship them in gold gift boxes (as shown in the first image). They are often done on a commission basis, and you may commission any painting that no longer falls under copyright protection, or I can do an original for you. 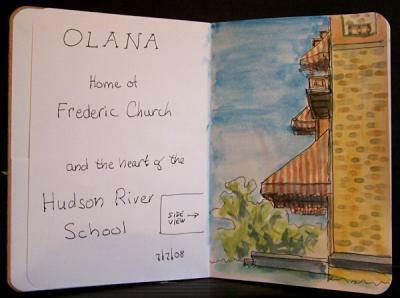 I had a wonderful excursion to Nyack today to paint along the Hudson River. The day was supposed to be very hot, so I left home early this morning to beat the heat. When I arrived at this wonderful path along the river, I was captivated by the yellow, atmospheric sky over the far hills across the river, and the shapes of the trees. This spot is very close to the parking lot, but I saw no reason to venture further, and set up my easel. I used more than my usual limited palette for this one, expanding my colors to a whopping seven tubes! 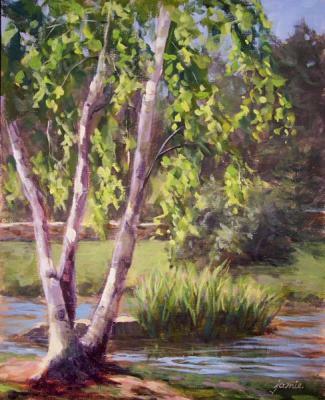 The buff titanium and naples yellow were great additions to my palette for this particular scene. I think they’ll likely become staples for these atmospheric, early morning paintings. 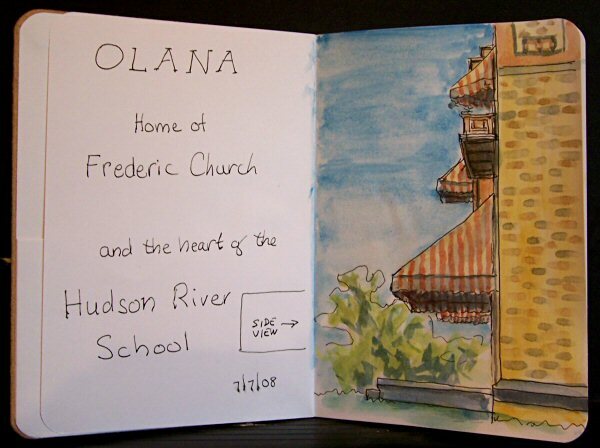 The Lower Hudson Valley Chapter of New York Plein Air Painters gathered at Stonecrop gardens in Cold Spring, New York today. Usually when we paint in Cold Spring we paint along the Hudson, but this beautiful garden presented us with some welcome and varied changes of scenery. 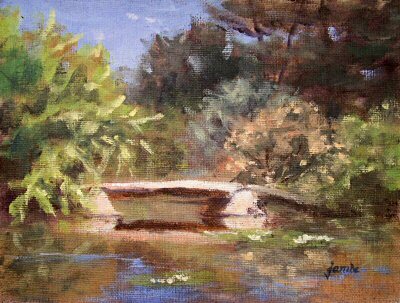 I started out down by this beautiful pond, with a stone bridge reflecting in the water. Golden OPEN Acrylic Paintings—a new category on my blog! The painting above was done last August at Boscobel Restoration, and was one of the first plein air paintings that I did with the new Golden OPEN Acrylic paints. I feel kind of sentimental as I think back to my first trip up to the Golden headquarters in upstate New York last summer. I dipped my brush into these paints for the very first time and felt the rush of excitement as I realized the potential of the jars of color before me. Here we are now, several generations of jars and tubes later, and the final product has been launched, and should be available in the stores within a couple of weeks. It’s been an amazing journey for me as an artist. I am delighted that the paint has reached its destination, and happy to have been a part of the process, yet I am sad that the fascinating and exciting development stage has ended. I guess I’m one of those people who loves a great experiment! I spent much of the morning reorganizing some blog categories here, and added a couple of new ones. Among them is a separate category for my favorites from among my Golden OPEN Acrylic Paintings. 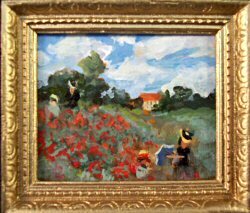 The category listings are on the right sidebar —->, and you can click that category anytime to see many paintings done with this special new medium. I’ll continue to add to it.